Virgin Galactic's SpaceShipTwo space plane rockets through the stratosphere at 71,000 feet, its highest flight yet, during its third powered test flight on Jan. 10, 2014. The supersonic flight occurred over California's Mojave Air and Space Port. Sir Richard Branson is asking the world to help him find the person who inspired his Virgin Galactic venture more than 25 years ago. Branson wants to find Shihan Musafer, a child who called in to ask him the following question on the BBC TV show "Going Live!" back in 1988: "Have you ever thought about going into space?" Sir Richard Branson speaks with the child Shihan Musafer by phone on BBC TV's "Going Live!" show in 1988. Branson credits Musafer for inspiring him to found Virgin Galactic and now, 25 years later, hopes to reconnect. 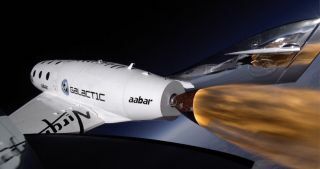 The question got Branson thinking seriously about building a commercial spaceline, he wrote in a blog post Wednesday (April 9). A quarter-century later, Branson's company Virgin Galactic has taken deposits from more than 700 people who want to fly to suborbital space aboard the six-passenger SpaceShipTwo, which could begin commercial operations by the end of the year. Now, Branson wants to find Musafer to express his gratitude. "We'd love to track down Shihan to say a personal thank-you for helping to inspire the idea with that phone call," Branson wrote in the blog post. "We want to offer Shihan the chance to join Virgin Galactic as a VIP guest to witness a spaceflight. Can you help us? If you think you can help with the mission to find #shihanmusafer, tweet @richardbranson and @virgingalactic." A ticket to ride SpaceShipTwo currently costs $250,000. During their suborbital flights, passengers will get to see Earth against the blackness of space and experience a few minutes of weightlessness, company officials say. Virgin Galactic isn't the only company selling seats on a suborbital spaceship. XCOR Aerospace, for example, charges $95,000 to ride its one-passenger Lynx space plane, which could begin flying customers around the same time that SpaceShipTwo does.